Genesis' GV80, the brand's first crossover, has been spotted undergoing road tests as it prepares to join the booming luxury utility market. 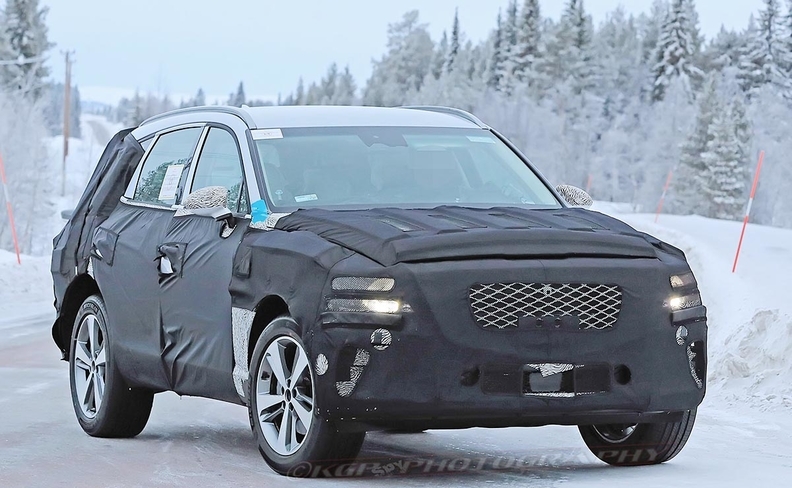 Based on prototypes of the crossover spotted in the Arctic Circle, the GV80 appears to have a grille design similar to those of the G70 and G80 Sport sedans. Genesis unveiled the GV80 concept as a fuel cell vehicle at the 2017 New York auto show. Global brand chief Manfred Fitzgerald told Automotive News last March that the three-row crossover could arrive at the end of 2019 or early 2020. Fuel cell or plug-in hybrid versions may be offered down the road. The GV80 is expected to be powered by a 3.8-liter V-6 from the G80 sedan with an added all-wheel-drive system. It is expected to offer about 280 hp. Genesis is also believed to be working on a turbocharged 2.5-liter four-cylinder that will go into the next G80, analysts say. The GV80 is to compete with German rivals, notably the Mercedes-Benz GLE and BMW X5, at a lower price. Genesis executives say the brand's crossovers will be designed and engineered to deliver emotional appeal. "The main thing is creating a DNA. You have to blend the spices in different ways if you're talking about SUVs or sedans," Luc Donckerwolke, design chief for Hyundai Motor Group, the parent of Genesis, said in November during the Los Angeles Auto Show. "What is an SUV? An SUV is actually a functional vehicle, but with an added flavor. We're trying to make functionality interesting by adding an adventurous flair. There's no reason for an SUV to exist if it doesn't bring this added emotional value." Editor's note: An earlier version of this misstated the size of the Genesis V-6 engine expected to be equipped in the GV80.